A leader in the use of technology to enhance cruise shipping safety, Celebrity Cruise Lines' Demetrios Kaparis broke ground last year with his decision to implement gas turbine power on Celebrity's Millennium — a technology that he cites is "the future of marine power plants." The vessel class, which consists of Infinity (scheduled to debut this month) and Millennium III and IV, debuting in April 2001 and 2002, respectively are touted by Kaparis as "The most environmentally sensitive cruise ships in the world." 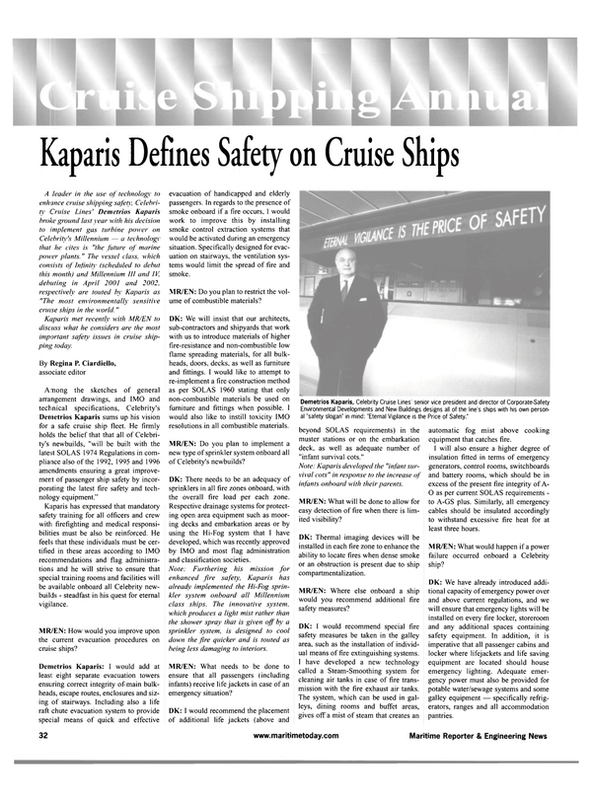 Kaparis met recently with MR/EN to discuss what he considers are the most important safety issues in cruise shipping today. By Regina P. Ciardiello, associate editor Among the sketches of general arrangement drawings, and IMO and technical specifications. Celebrity's Deriiietrios Kaparis sums up his vision for a safe cruise ship fleet. He firmly holds the belief that that all of Celebrity's newbuilds, "will be built with the latest SOLAS 1974 Regulations in compliance also of the 1992, 1995 and 1996 amendments ensuring a great improvement of passenger ship safety by incorporating the latest fire safety and technology equipment." Kaparis has expressed that mandatory safety training for all officers and crew with firefighting and medical responsibilities must be also be reinforced. He feels that these individuals must be certified in these areas according to IMO recommendations and flag administrations and he will strive to ensure that special training rooms and facilities will be available onboard all Celebrity newbuilds - steadfast in his quest for eternal vigilance. MR/EN: How would you improve upon the current evacuation procedures on cruise ships? Demetrios Kaparis: I would add at least eight separate evacuation towers ensuring correct integrity of main bulkheads, escape routes, enclosures and sizing of stairways. Including also a life raft chute evacuation system to provide special means of quick and effective evacuation of handicapped and elderly passengers. In regards to the presence of smoke onboard if a fire occurs, 1 would work to improve this by installing smoke control extraction systems that would be activated during an emergency situation. Specifically designed for evacuation on stairways, the ventilation systems would limit the spread of fire and smoke. MR/EN: Do you plan to restrict the volume of combustible materials? DK: We will insist that our architects, sub-contractors and shipyards that work with us to introduce materials of higher fire-resistance and non-combustible low flame spreading materials, for all bulkheads, doors, decks, as well as furniture and fittings. I would like to attempt to re-implement a fire construction method as per SOLAS 1960 stating that only non-combustible materials be used on furniture and fittings when possible. I would also like to instill toxicity IMO resolutions in all combustible materials. MR/EN: Do you plan to implement a new type of sprinkler system onboard all of Celebrity's newbuilds? DK: There needs to be an adequacy of sprinklers in all fire zones onboard, with the overall fire load per each zone. Respective drainage systems for protecting open area equipment such as mooring decks and embarkation areas or by using the Hi-Fog system that I have developed, which was recently approved by IMO and most flag administration and classification societies. Note: Furthering his mission for enhanced fire safety, Kaparis has already implemented the Hi-Fog sprinkler system onboard all Millennium class ships. The innovative system, which produces a light mist rather than the shower spray that is given off by a sprinkler system, is designed to cool down the fire quicker and is touted as being less damaging to interiors. MR/EN: What needs to be done to ensure that all passengers (including infants) receive life jackets in case of an emergency situation? DK: I would recommend the placement of additional life jackets (above and beyond SOLAS requirements) in the muster stations or on the embarkation deck, as well as adequate number of "infant survival cots." Note: Kaparis developed the "infant survival cots" in response to the increase of infants onboard with their parents. MR/EN: What will be done to allow for easy detection of fire when there is limited visibility? DK: Thermal imaging devices will be installed in each fire zone to enhance the ability to locate fires when dense smoke or an obstruction is present due to ship compartmentalization. MR/EN: Where else onboard a ship would you recommend additional fire safety measures? DK: I would recommend special fire safety measures be taken in the galley area, such as the installation of individual means of fire extinguishing systems. I have developed a new technology called a Steam-Smoothing system for cleaning air tanks in case of fire transmission with the fire exhaust air tanks. The system, which can be used in galleys, dining rooms and buffet areas, gives off a mist of steam that creates an automatic fog mist above cooking equipment that catches fire. I will also ensure a higher degree of insulation fitted in terms of emergency generators, control rooms, switchboards and battery rooms, which should be in excess of the present fire integrity of AO as per current SOLAS requirements - to A-GS plus. Similarly, all emergency cables should be insulated accordingly to withstand excessive fire heat for at least three hours. MR/EN: What would happen if a power failure occurred onboard a Celebrity ship? DK: We have already introduced additional capacity of emergency power over and above current regulations, and we will ensure that emergency lights will be installed on every fire locker, storeroom and any additional spaces containing safety equipment. In addition, it is imperative that all passenger cabins and locker where lifejackets and life saving equipment are located should house emergency lighting. Adequate emergency power must also be provided for potable water/sewage systems and some galley equipment — specifically refrigerators, ranges and all accommodation pantries.